Joy in the midst of tragedy? Then a woman said, “Speak to us of Joy and Sorrow.” And he answered: Your joy is your sorrow unmasked. And the selfsame well from which your laughter rises was oftentimes filled with your tears. And how else can it be? The deeper that sorrow carves into your being, the more joy you can contain. Is not the cup that holds your wine the very cup that was burned in the potter’s oven? And is not the lute that soothes your spirit, the very wood that was hollowed with knives? When you are joyous, look deep into your heart and you shall find it is only that which has given you sorrow that is giving you joy. When you are sorrowful look again in your heart, and you shall see that in truth you are weeping for that which has been your delight. Some of you say, “Joy is greater than sorrow,” and others say, “Nay, sorrow is the greater.” But I say unto you, they are inseparable. Together they come, and when one sits alone with you at your board, remember that the other is asleep upon your bed. Verily you are suspended like scales between your sorrow and your joy. Only when you are empty are you at standstill and balanced. When the treasure-keeper lifts you to weigh his gold and his silver, needs must your joy or your sorrow rise or fall. We later reflected that tragedy is the norm for human life. Utopian visions of progress are a Western construct of the last 300 years. 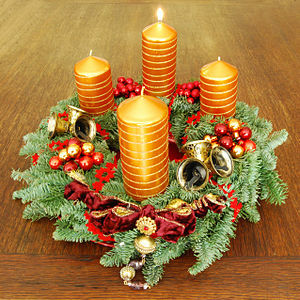 The biblical tradition holds in tension the realities of gain and loss, despair and hope, death and life, sorrow and joy. Richard Rohr, in Falling Up, reminds us that the Greek word for tragedy is “goat story” – it follows the path up, down, backwards, forwards with lots of learning along the way. The answer to the questions of life’s tragedies lies not in definitive statements but in holding life’s contradictions in creative tension. So how do we respond to the Advent theme of joy? Not by pretending the tragic is not there, but by engaging and responding to it the best way we know how. A father walked in on his son glued to the TV news of the aftermath of some natural disaster. The destruction was wide and the lament of the survivors overwhelming. “Look for the helpers, son, look for the helpers,” said the father. Joy cannot be forced, nor can it be chosen in the way one can choose hope or peace. But it can surprise us in the midst of sorrow. And this is gift. Goat story? Really? What an incredible analogy, WP. Ups and downs. And we must stay sure footed on the path, whether it is high or low. Kate, it really does offer some fresh perspective when one is working through one’s response to confronting and traumatic events. I’d like to have been there. Sounds like a wonderful service of affirmation and hope. Thanks. Thank you, Ian. We gathered looking for that light that shines in the darkness.